A series has to be special to hook me. Generally, sci fi will hook me pretty quickly – love Anne McCaffrey! Romance is another animal – I think it’s very tough to write a series, especially if you’ve written a very satisfying ending for your initial story. I also find that sometimes a romance/paranormal series becomes nothing more than a retelling of the same plot with new names. That usually loses me as a reader. So I guess I’m torn. Julia – I’m afraid that’s how I’m feeling at the moment. Like it’s the same story with different names. I’m totally not putting this on the author though. I think the publishers are carrying a huge burden of the responsibility. I sometimes find past characters popping up in other books; case in point, I wrote Kenzie’s ‘All She Ever Wanted’ as a stand-alone. But a reader asked about another character, so I wrote his story. And surprise…characters from an UNRELATED story arrived, so now it’s a trilogy! And while writing another story, all of a sudden characters who are babies in a yet-to-be-finished Molly story are being discussed in Kenzie’s upcoming ‘Teacher’s Pet’ book. Strange…. Molly – There are a lot of people who like the idea of finding out what happened to other characters within a story. I know it’s fun as a writer to discover a character’s untold story and give them a true love. The benefit to series is that the characters and the world have already been partly constructed, which is always the hard part of writing any book. The reader already knows what to expect regarding many basic points. The publisher has a baseline to judge the saleability of new books by. The problem is that authors eventually pan out, unable to write a story that extends what came before, or they get so spread out that the story doesn’t flow anymore, or worst of all, the series changes over time to become something it wasn’t at the beginning. The thing I hate most is a series that has a natural ending point, that gets continued because it will still make money, and the story gets corrupted. I’ve become more willing to drop series over time, for these reasons. I have a few authors that I’ll read regardless, but none that I’ll read everything. Marc – And there’s an excellent point “a series that has a natural ending point, that get continued because it will still make money” There’s where the publishers assume readers will blindly follow because the first few books in a series were excellent. I’ve learned not to put this on the author. I’ve been dropping series left and right for this exact reason. Nina, I know what you mean about some series not working for you. Maybe those you don’t continue to enjoy shouldn’t have been series in the first place. I find that after two or three series books, I am ready for something new. I’m still reading Stephanie Plum but I’ve stopped reading some other continuing series. That said, I wrote a series in my Silhouettes and am working on a single title series now, but only 3 books, not open ended. Susan – I think three is my limit in a series. (That being said … both series mentioned above had more than three.) But I don’t think a writer can keep things fresh after three books. I love Anne McCaffrey as well. While I don’t mind a series per se…I mind a series that goes on and on and on. I think Three to Five books are good. Unless you change directions for the basic plot, I think going over 5 is going to cost you readers. Even when I read mysteries…if you don’t resolve some of the overall arc issues by book 8, I stop reading you because I feel like I’m not learning anything new about the characters. It starts to feel the same. What I loved about Anne McCaffrey were all the different worlds. Or different Characters/Time with in a world. In the Pern series, Ms. McCaffrey had a lot of books but really only focused on a set of three books at a time. Same with Mercedes Lackey’s Valdemar series. Lots of books but only in sets of three with different times/characters as the main focus. And, yes. I’ve had the same feeling with loving the first book and not liking the next books. I’ve started fetting new authors via the library before I’ll buy into a new series. Beth – You hit the proverbial nail … it has to take the books in a different direction. 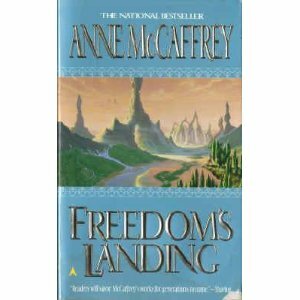 I know what I loved about the “Freedom” series is that Ms. McCaffrey took the characters to different worlds. Created new and interesting conflicts between the characters. Nothing got stale. That’s a definite talent to keep the reader engaged like that. I”m with Marc. It drives me bananas when sequels get published, and a ‘series’ created, when the original idea has lost steam. It smacks of blatant consumerism. To me the appropriate way to create a series is to lay out a rich enough conflict that can sustain the story over several books, and wrap it up at the end. Examples include Karen Marie Moning’s Darkfever series, which is one rich story going over 5 books. when an author endlessly spins off secondary characters into their own book, after awhile the names all blur together (unless the author can create really distinct characters). I do understand the idea of wanting to mine a unique world that you created with more than one story once the readers are familiar with it. That makes sense for, say, 3-4 books. Unless you’ve laid out a really good conflict. But please. Don’t spin it for 13-14 books! Even Diana Gabaldon’s Outlander series has become a bit stale at the 8th book. The same goes for TV series. The Sopranos was Great, daring, brilliant, and ground breaking for about 1 season. Claudia – Hear! Hear! Don’t assume we’ll follow blindly into the mist just because we bought (and enjoyed) the first couple of books. I’ve got to imagine the authors are sort of bored with the whole thing as well when the story begins to “feel” formulaic. I love reading series as long as the characters continue to grow. It’s great to go back to characters I know and love and see what they’ve been up to. I also love series that feature secondary characters in prior books. If I know and love the world, as far as I’m concerned the more stories, the better. I feel this way with my own writing, as well. My paranormal romances are part of the same series (featuring half-brothers), and my urban fantasy was written with several sequels in mind. The only time I don’t enjoy sequels is when things happen that seem out of character. Rosalie – I think you’ve said what a lot of people commented on and that’s the character growth and change HAS to be part of the series or it just doesn’t work. I too love to think of the what-if of the secondary characters in my stories. As a writer, i can constantly come up with stories for every single one of characters, if I were allowed. As a reader, however, and a long time reader of SF/Fantasy, and especially as a reviewer, hm… I don’t love series so much. Truth to tell, they sort of annoy me to review, especially if a publisher sends me book two, three, or five of a series I’ve never read or heard of. I’ admit it. I feel dumb saying “Well, I’ve never read any of the others, but book 8 sure is good.” :p I know they can’t afford to send me all of them, but a nice little synopsis might be nice. So…I don’t know, I’m split on the question, I guess. Julianne – I think as a writer it’s so true … we can come up with stories for all our characters. Interesting on the review end though. I know I hit a book once that turned out to be in the middle of a series and it drove me crazy when the author made references to other characters and it appeared I should know their story. I can’t even imagine what I’d have to say if I were reviewing it. I think this is why I wonder why agents always ask “Is it a series?” I’ve questioned many writers on can you write in a genre using a character from a different genre and the response is always, You don’t want to do that. Example: The not so nice person in a romance give them a story but in maybe a mystery or suspense as apposed to the line they came out of. If I put them in the same genre, I may as well make it a sequel. 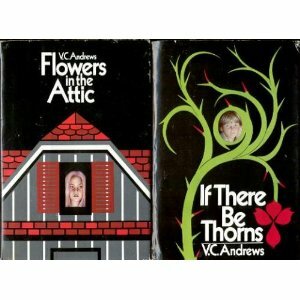 By the way flowers in the Attic, was disturbing at first, but I could not put it down. Diana Gabaldon’s series are great because her main characters are very strong, each character is very distinctive. Laurell K Hamilton’s series barely have any women in them and the main character, Anita or Meredith, is the only woman in anybodies bed until this latest book, Bullet. Maybe that’s the pull, see who she’ll get with this time. Mary – I’ve been looking at creating a new series myself because agents/publishers are asking for it. But now with the way I’m feeling I’m wondering if other readers are tired of the series aspect of stories. It really is a hard question. And I haven’t tried either of the series you’ve mentioned, but I’ve heard a lot about both of them. Hmmm, guess maybe I should give them a try. Thanks for the insight. If you do give these a try, I’d be very interested in a follow-up post on whether you think they do a good job on the series idea, or a bad job. These two are some of the more well-known series’ to come out of the romance genre. Actually the ones I’m reading are very well known authors even though these series are newer. But I haven’t tried Laurell K. Hamilton and that is one series I have definitely been looking at trying. Ohhhh, Flowers in the Attic series. Fantastic. Loved them enough to read them twice. I write mainly series in my other name. 10K-ish a piece. I love writing the shorter books, but at the same time know I can go back to my “people” and continue the story. The hard bit is knowing whether to do a 5 parter or more. Mine have so far all been five, but at times there is scope to do so many more than that. Natalie – I do think there’s a big difference between a 10k story and a 90k story about the characters. You definitely would be able to hold the reader’s attention through more of the shorter ones IMHO since you only told a portion of the story. Sounds like a great way to leave the reader wanting more. I have a sinking suspicion that the series that cause disconnect are the result of a publisher encouraging an author to do a series when one isn’t planned. Pretty much everything I write is a series- but I have plans for them that end at a certain spot. I hate it when the series has died and the author keeps going (again, I’m sure, spurred on by an editor). Marie – I suspect you are right. That a series that seems to have played itself out was probably the result of an enthusiastic editor or marketing department. Hi Nina! I saw you posted to Julia’s blog today and mentioned JK Rowling as an example of a series that didn’t work for you (paraphrasing). While it may seem like Rowling has spun her wizards into as many books as she could, I disagree that it fits the formula about a series that has become repetitive and sterile. Regardless of the repetitive nature of some of Rowling’s plot elements (quidditch matches, Voldemort coming back over and over again), her books have quite a few layers that build together into a remarkable work of literature. I’m not claiming that you have to love it. But it would be wrong to throw the Harry Potter books into the same pot with all the other series. Yes, it’s commercially successful. But she’s done a remarkable job of weaving more than one theme together into a coherent story. In fact, I can’t think of another book series that is so complex and rich with allegory. In fact, Rowling is an example I would give about how a series should be done. Namely having an overall arc that closes off, conflict and themes that *require* more than a single book to expound upon (in other words big, timeless themes — and not just someone trying to take over the world), great world-bulding, all couched in a story that is a romp and entertaining. Yeah – that was probably the 5th one. It did ramble, and also the main character was an incredible bratty teenager in it (which is probably the main reason for it being annoying, and a lot of adults’ least favorite). Nonetheless, from a writer’s perspective, she did a thing which I still study – namely introduce a huge amount of backstory on the antagonists using the Black family tree. She even had a huge org chart, with characters on it that she had one character describe to another the various relationships. Since some of these characters are redeemed at the end of the septology, this book contains some great exposition without being obtrusive (to me). She hid one of the mysterious talismans that the characters (and readers) search for later. I don’t think any of it was gratuitous. The Dolores Umbridge character was marvelous political allegory. And since almost all of her books deal with death and grief in some way, the way this book ends is powerful drama for kids. The follow-up book (the 6th) was filled with even more backstory. (And is the least ‘charming’ for my taste), so I can see it not being the book that draws the disinterested reader back. Well anyway, I’m not trying to talk you into it! (smiles). Interested in all the reactions to a great post. I write series, and love doing so. Don’t like Rowlings, though, just to be contrary. Each of my series books follows a different member in a family, and finally the grandchildren, and I research a lot for the various years involved. The ties are there, and I hope explained briefly, but not the focus of the book. My fifth book in the Druid series just finaled in the Epic contest, so it can’t be too bad. In other words, I love reading series and writing them. Jean – I’ve come to the conclusion that those are my favorite type of series … the ones with different characters and perhaps even in different time periods but held together by a common thread. Your Druid series is a great series.